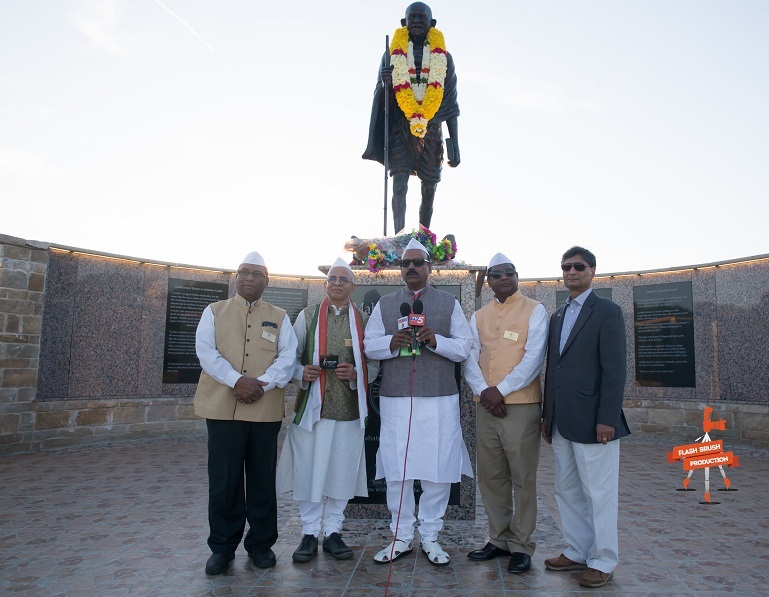 Dallas, TX: The Honorable Chief Minister of Andhra Pradesh Sri Chandra Babu Naidu visited the Largest Gandhi Memorial in USA located in Dallas, Texas on May 6, 2017 and performed rich floral tribute to Father of Nation Mahatma Gandhi. 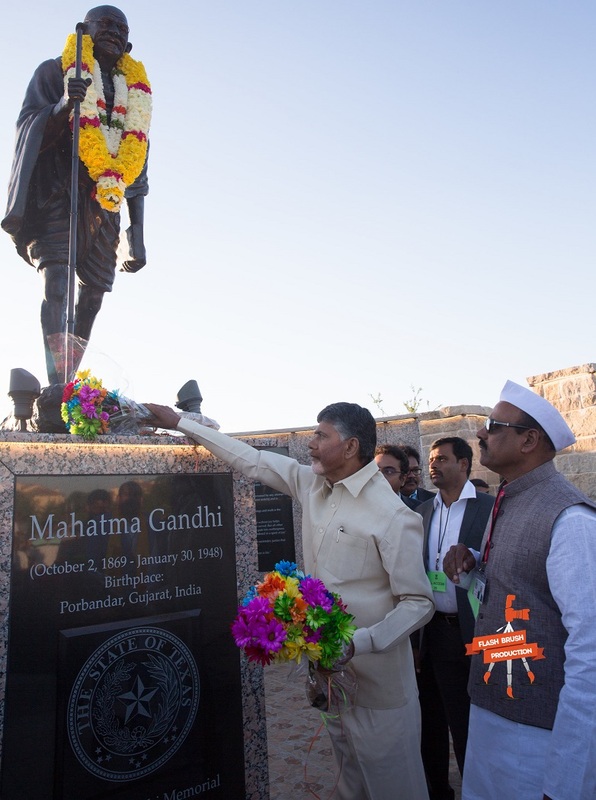 The Chief Minister appreciated the leadership of Dr. Prasad Thotakura in building such a great memorial in beautiful city Irving. In the same context, the chief minister praised MGMNT Chairman Dr. Prasad Thotakura and his Team members Mr. Rao Kalvala, Mr. MVL Prasad, Mr. Piyush Patel, Mr. John Hammond, Mrs. Shabnam Modgil, Mr. Taiyab Kundawala, Mr. Jack Godhwani, Mr. Salman Farshori, Mr. Kamal Kaushal for their the relentless efforts of building the Gandhi Memorial in 5 months with one million dollars budget and collaboration with Irving City Mayor and its officials for more than 4 years. 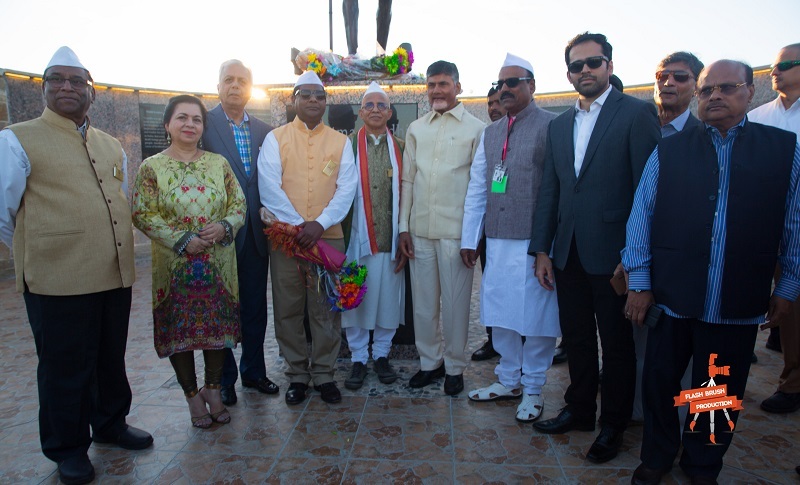 Dr. Prasad Thotakura specially thanked the AP Chief Minister Sri Nara Chandrababu Naidu for making time in his busy schedule and visiting the Gandhi Memorial, the revenue minister Sri Yanumala Ramakrishna, AP Government Media Advisor Paritala Prabhakar, APNRT CEO Dr. Ravi Vemuru and other Government Officials. Greetings! The initiative you are showing in the construction of NavyaAndhraPradesh is very much appreciated. All the Telugu people across the globe ​​are looking forward and eagerly waiting towards the historic rise of the Amravati city. Irrespective of caste, religion, political affiliation all Telugu people across the world get united when it comes to the aspect of Telugu cinema, language, literature, music, dance, fine arts etc. 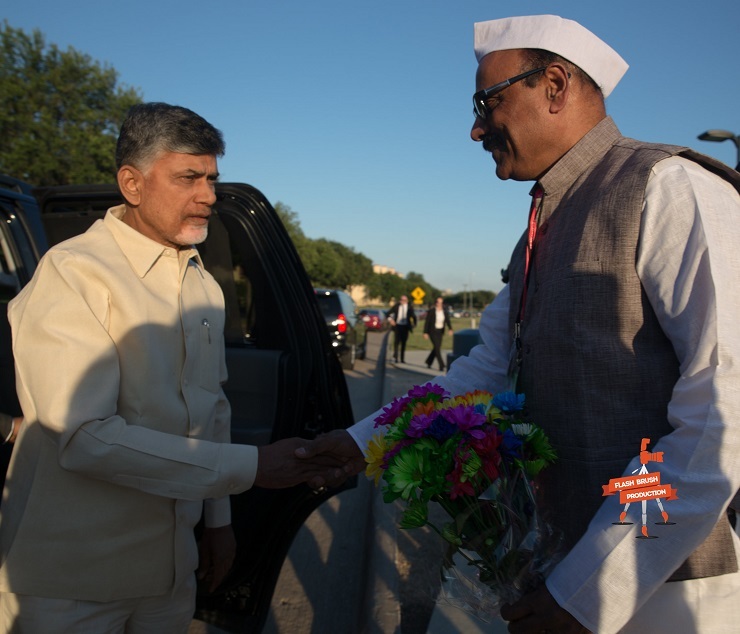 On behalf of all Telugus abroad, we request you that as a Chief minister to spread the proudness and the great history of Telugu and Andhra Pradesh. As part of this effort we request you to select famous poets, artists, writers, and dancers in various fields in Andhra Pradesh on behalf of the state government and sponsor them to different countries in the world to spread the greatness of Telugu culture and language, especially for the second generation. Most of the Top NRI’s in the fields of science, technology, education, medical, business, visit our motherland for some reason every day. But unfortunately their visits go unnoticed. Many of them are interested to share their vast experiences in academic, medical, and business, and offer free services. It is a great opportunity for people of our homeland to utilize their volunteer community services. Hence, I request you to setup a system where interested NRI’s can register their arrivals, departures and available times to serve when they visit our homeland. We also request the Andhra Pradesh government to invite the talented children in various fields to visit Andhra Pradesh and encourage them to work for some period of time in various government and private sector organizations where they will be able to learn about their origins by understanding our traditional Telugu culture and lifestyle. It is mutually beneficial by introducing talented NRI kids those who excel in different fields to our people in homeland. Similarly we encourage the government to organize competitions in various fields for the students and send the winners to different countries where many NRI individuals and organizations come forward to host these winners and provide them an understanding of Western Culture. Though a ministry for the integration of non-resident Telugu’s to the Government of Andhra Pradesh has been formed unfortunately that ministry is not able to do justice as the same minister is allocated many other ministries. If there is a special ministry with an adequate number of personnel who can work 24 hours a day to conduct correspondence in different time zones with non-resident Telugu’s settled in different countries, we can achieve marvelous excellent results. So we request you to please, focus on this topic, and find appropriate resources where we can encourage the talented NRI’s and service their intellectual use to our homeland. Every year on behalf of the Andhra Pradesh government, we should celebrate "Annual Pravasa Telugu Sammelanam" in our home land by inviting Telugu’s across the globe to share their intellect and vast experiences that benefits our homeland.